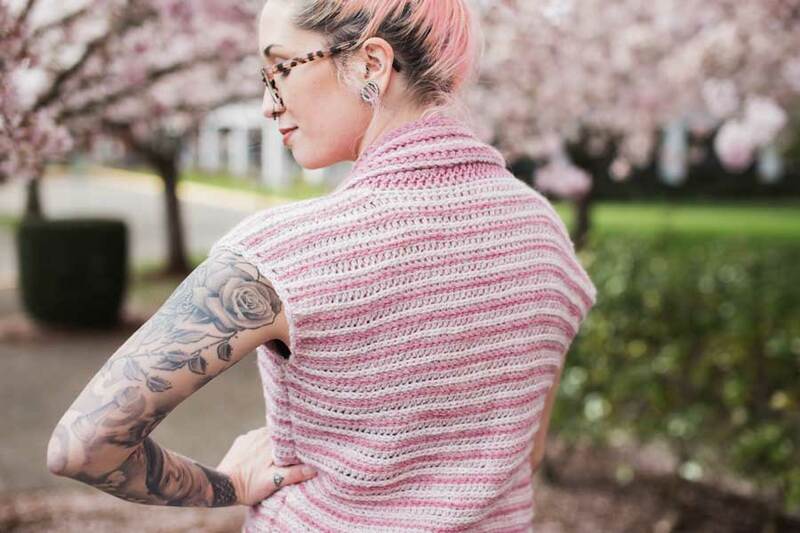 I am so excited and proud to announce this wonderful pattern, Ophelia Vest. 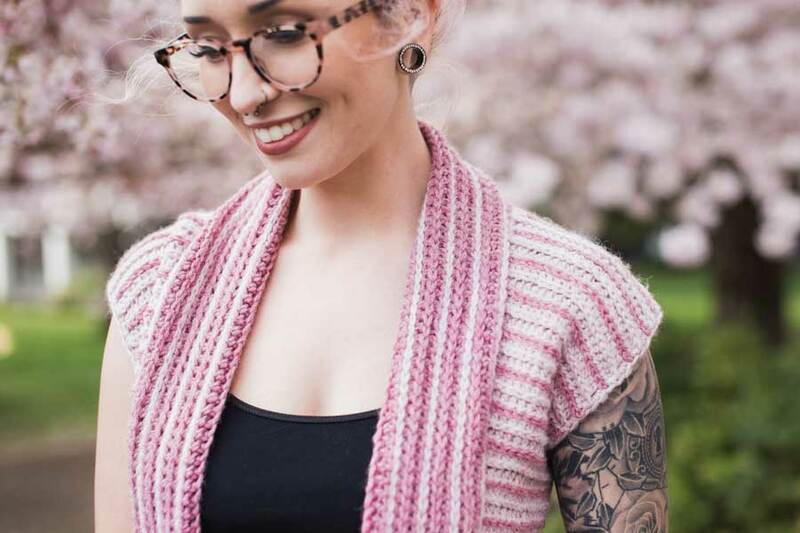 I have had the opportunity to collaborate with my friends at Lion Brand Yarn to design this project as well as to be able to offer it as a kit on their website! You can check out the full kit listing here! Over the next several months I'll be working hard to add more kits to our fun collaboration and I hope you enjoy it all! 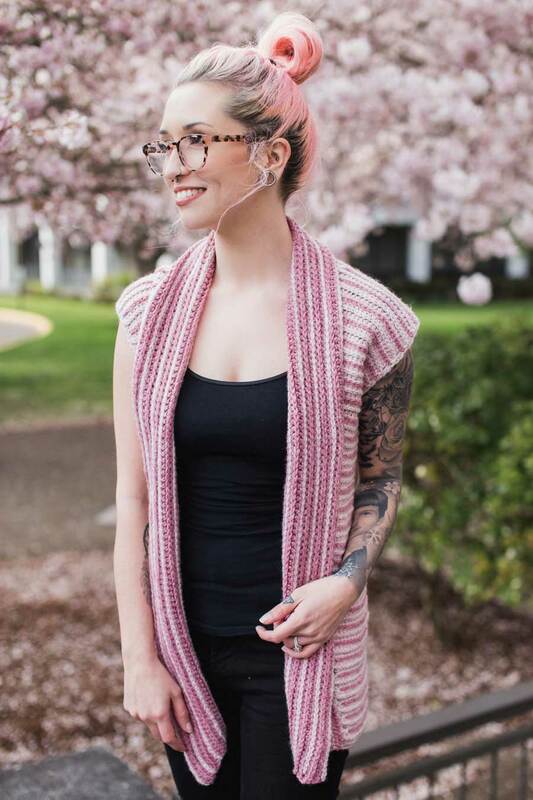 Want to snag a printer-friendly and beautifully templated version of this pattern?! Head over to Etsy, Ravelry, and Love Crochet to snag your copy! Thank you for supporting me!! This post may contain affiliate links. All ideas and opinions are my own genuine and true feelings. 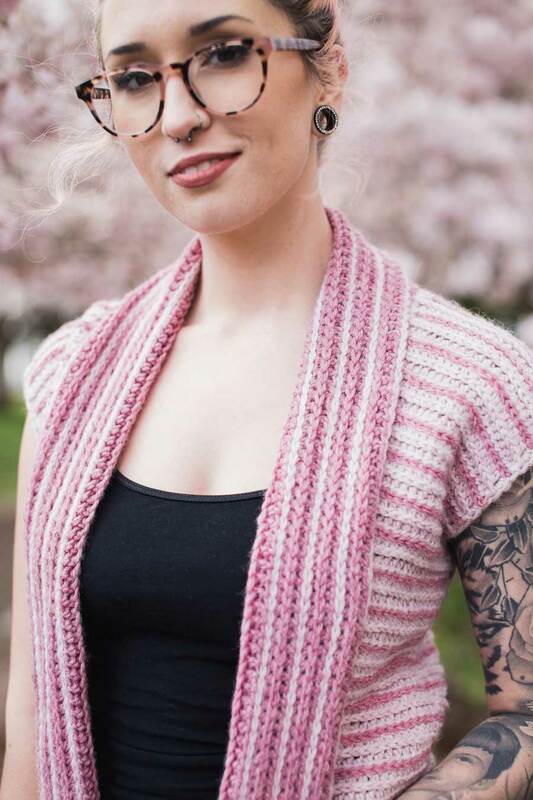 If you would like a printer-friendly, beautifully templated version of this pattern, you can find them available for purchase on Etsy, Ravelry and, Love Crochet. The BRAND NEW pattern template was gorgeously and custom designed by Teresa Carter from DeBrosse NYC - check out her other pattern templates and products in her Etsy shop! Create this trendy vest to wear in all seasons! 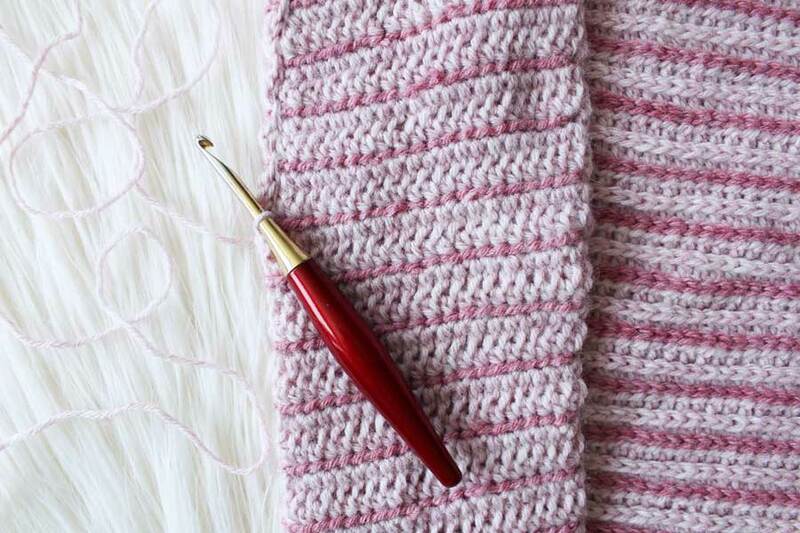 Even though this design is made up using easy stitches, the addition of surface crochet really makes this design unique! 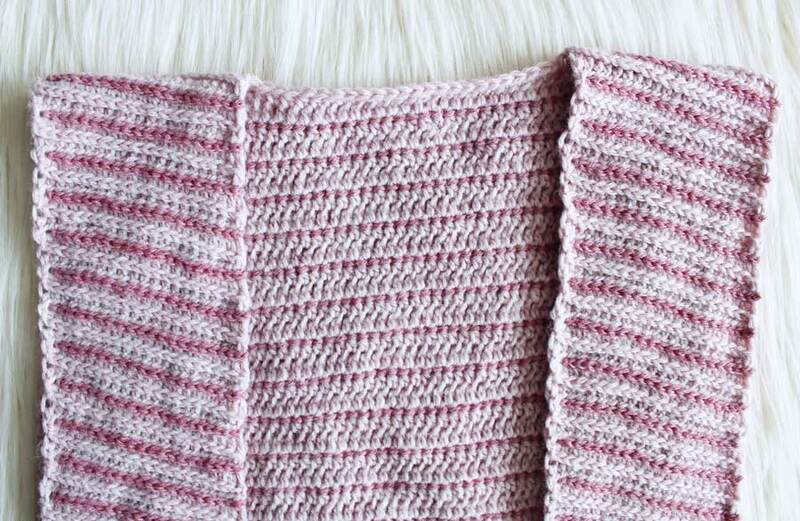 With a mimicked knit look, and beautiful contrast detailing, this is for sure to be a staple in your pattern library! 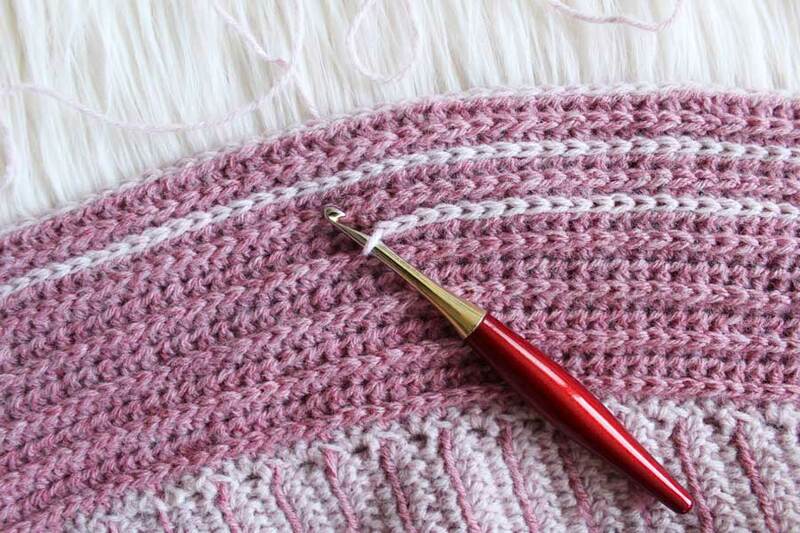 This is an intermediate level pattern and uses basic crochet techniques to complete in addition to surface crochet. See link below for reference! You may sell items made from using this pattern but PLEASE remember to reference my shop, The Hook Nook, for which pattern you used. Thank you! 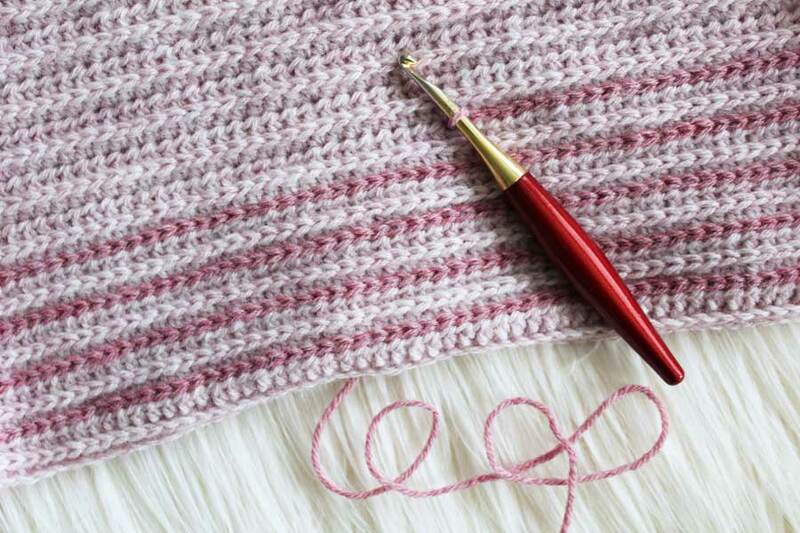 In this pattern, we work in the “third loop” of the HDC stitch. You can find the third loop on the wrong side of the stitch, just below the “V”. By working in this loop, it pushes the “V” forward, imitating knit stitches. We will be creating contrast stripe detail using surface slip stitches. 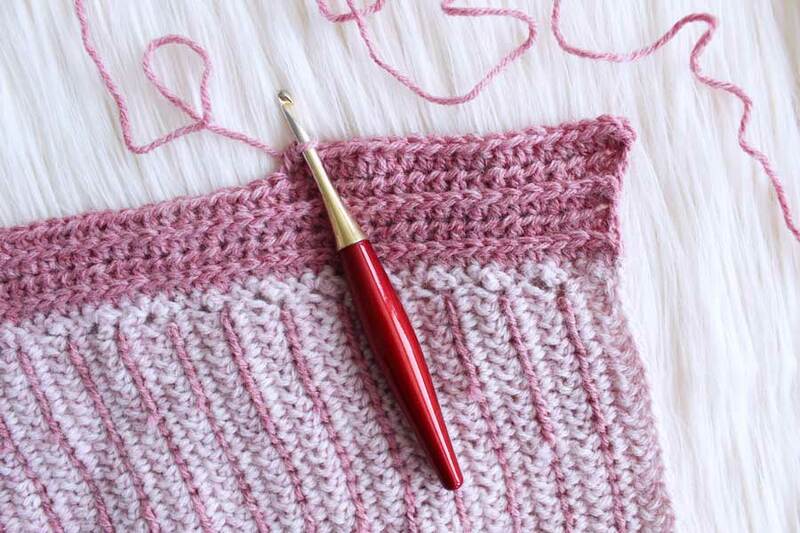 To create a surface slip stitch, insert your hook into your work first with no yarn attached. 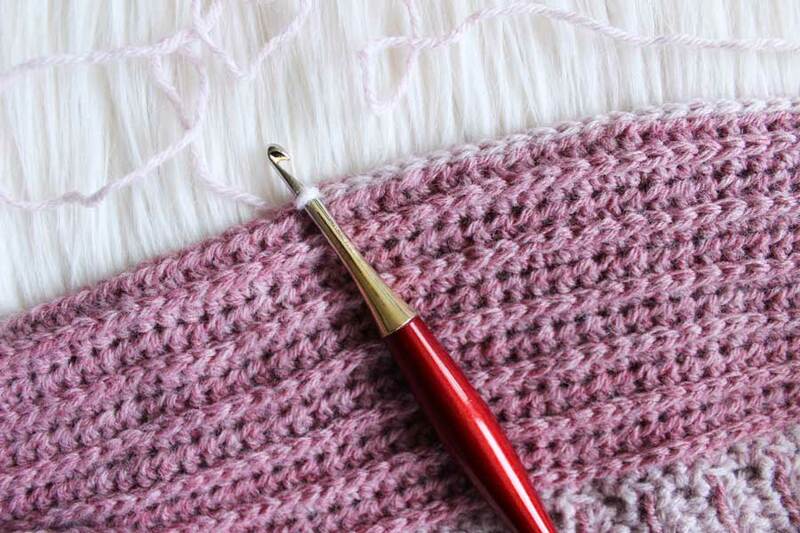 Place yarn onto hook and pull through a loop back to the front of your work. 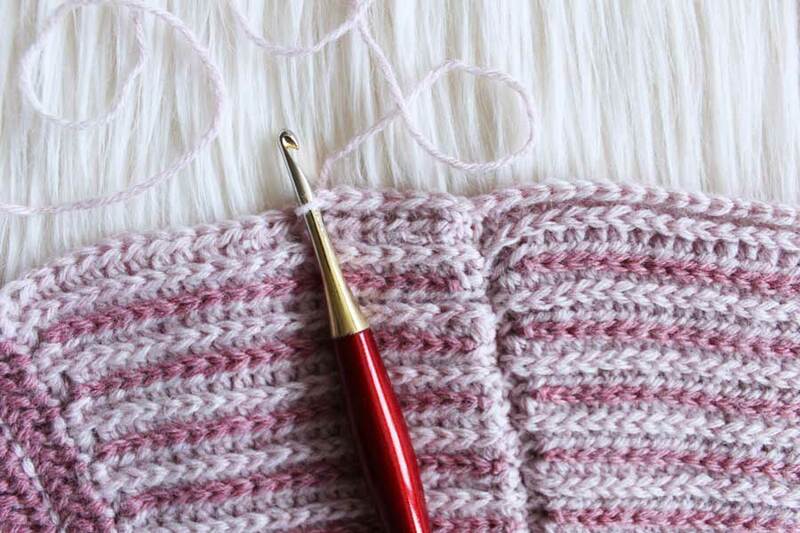 Insert your hook into your next designated stitch, grab the yarn from behind and pull up a second loop. “Slip” the second through the first loop. To see an informative video tutorial, check out this post from Moogly Blog here. Construction notes: We will begin working up the back panel. Once back panel has reached specified length, we will work the first front panel directly off of the back panel, then finish off. We will reattach our yarn to create second front panel. We will add surface Sl St design onto both front and back panels. After seaming, we will create the collar section and finish off adding the surface Sl St design onto collar. Repeat Steps 2-3 until your piece measures 23.5” long for sizes S-XL. For size XXL, repeat steps until piece measures 24.5” Do not worry if your work begins to “curl” on the sides, this will be corrected once we weave in ends and begin collar section. Also, do not worry if your work begins to look like it’s not lining up, or that it’s “angled”. This will be corrected later on. Repeat Steps 6-7 until this narrow section measures 25” long for sizes S-XL. For size XXL, repeat steps until piece measures 26”. Finish off. Repeat Steps 10-11 until this narrow section measures 25” long. Finish off. We are now going to create the contrast stripe detail using Color B. Attach yarn to back panel, in between two raised Color A “stripes”. Surface Sl St across. Finish off. Be sure to keep your Sl Sts loose so you do not “cinch” your fabric! Repeat Step 13 for entire back panel, as well as both front panels, working in between each 3rd loop row (this will create a beautiful stripe texture). Don’t hate me, there are going to be TONS of ends to weave in, but I promise it will be worth it! ‍Work up both back panels and front panels, as according to pattern. 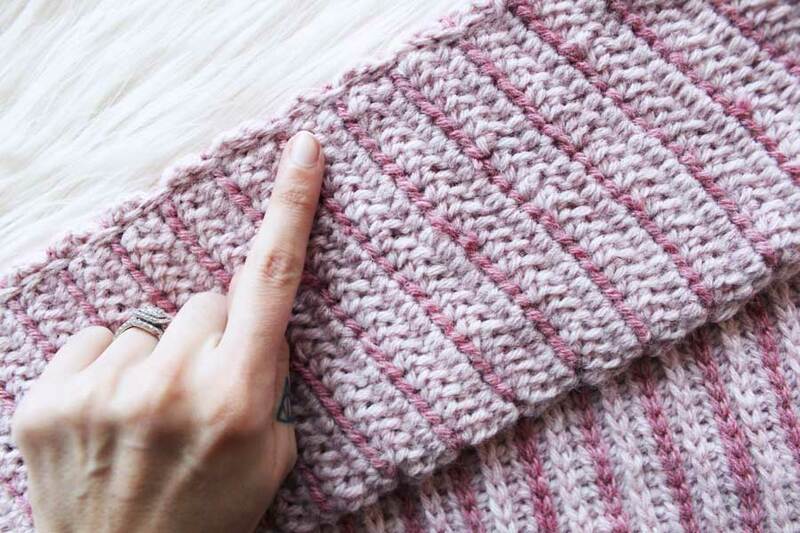 ‍Create surface slip stitch stripe detail. ‍Continue surface slip stitch stripe detail for entire back panel, as well as both front panels. ‍Your piece should look similar to this after all stripes have been added. Lay cardigan flat with front panels on top of back panel, right sides facing each other and wrong sides exposed. Place stitch markers where the armpit of your cardigan will be. 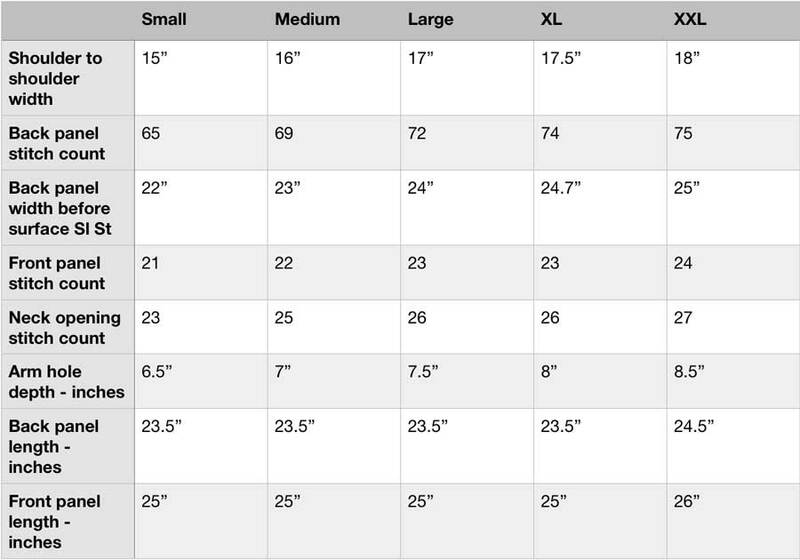 See chart above for proper measurements. Using Color A, attach yarn with Sl St to bottom corner of cardigan, through both front and back panels together. *CH 1, Sl St through next st in both panels. Repeat from * to stitch marker. Work this up the side of the cardigan until you reach your stitch marker. Finish off. Repeat for other side of cardigan. Seam front sides of vest. ‍This is what your seam should look like. 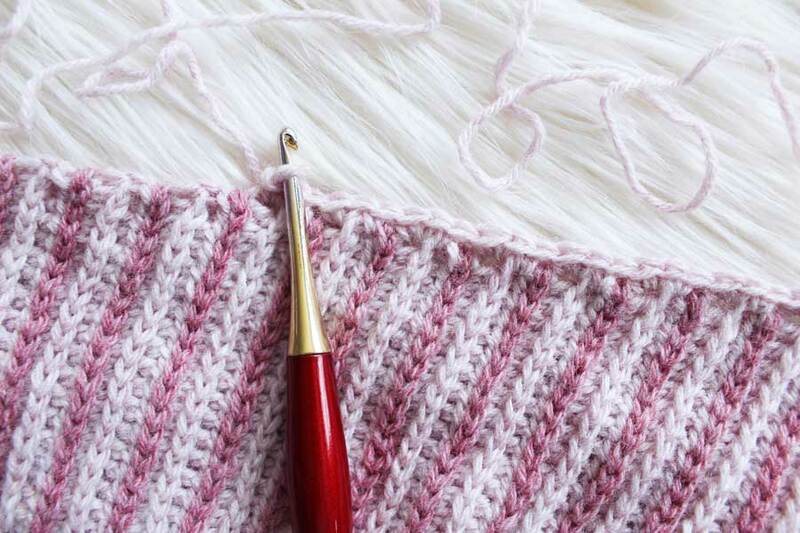 ‍Be sure to align surface slip stitch stripes while seaming, to create a cohesive design. ‍SC around front panel, around neckline, and down other side of opposite front panel. When wearing the vest, attach Color A with Sl St to bottom inside corner of right front panel. CH 1. With RS facing you, work SC in the ends of the rows of the front panel, SC evenly up the panel to the neckline by placing 3 SC for every 2 HDC rows. One way to check this, is from one Sl St row to the next, you are adding 3 SC. Once at neckline, place 1 SC in each HDC st across the neckline for 23(25, 26, 27) SC then work SC down the left front panel, just as you did for right front panel. End at bottom inside corner of left front panel. Using Color B, attach yarn to last st created with a Sl St. CH 1, HDCINC in first st. HDC in each st around the neckline to other bottom corner. HDCINC in last st.
CH 1, turn. HDC in 3rd loop around neckline to other bottom corner. CH 1, turn. HDCINC in first st. HDC in each st around the neckline to other bottom corner. HDCINC in last st.
Repeat Steps 3-4 five more times. Repeat Step 3 one time. CH 1, turn. Sl St in each st across. Finish off, weave in ends. We are now going to create the contrast stripe detail using Color A. Attach yarn to bottom corner of collar, in between two raised Color B “stripes”. Surface Sl St around to other corner of collar. Finish off. Be sure to keep your Sl Sts loose so you do not “cinch” your fabric! Finish off. Repeat Step 17 for entire collar section. Note: There will be five contrast stripes for the collar. ‍Working off of Color A SC row, create collar section using Color B. 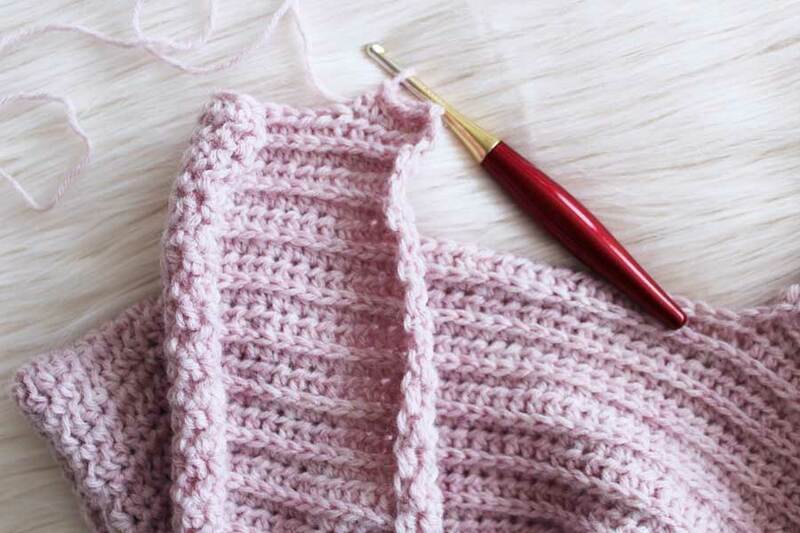 ‍Slip stitch for last row of collar, using Color A. 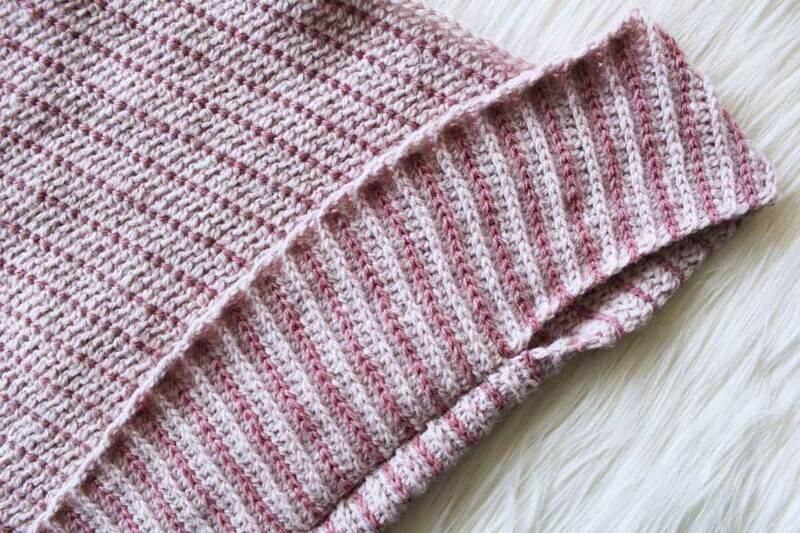 ‍Create surface slip stitch stripe design onto collar section, using Color A. ‍SC on bottom hem of vest. Using Color A, SC along the bottom of your vest to “clean it up”. This creates a nice transition between the seams and allows the bottom to lay beautifully against the body, instead of folding inwards. After weaving in all ends, I highly recommend steam blocking your piece to release the stiffness of the acrylic yarn. This will allow your piece to have beautiful drape and more flexibility. Place your vest on a hanger and using your steamer (don’t have one? You can get this one on Amazon! ), steam each part of the piece. Let dry. Put that baby on and never take it off. I hope you all have enjoyed this pattern! 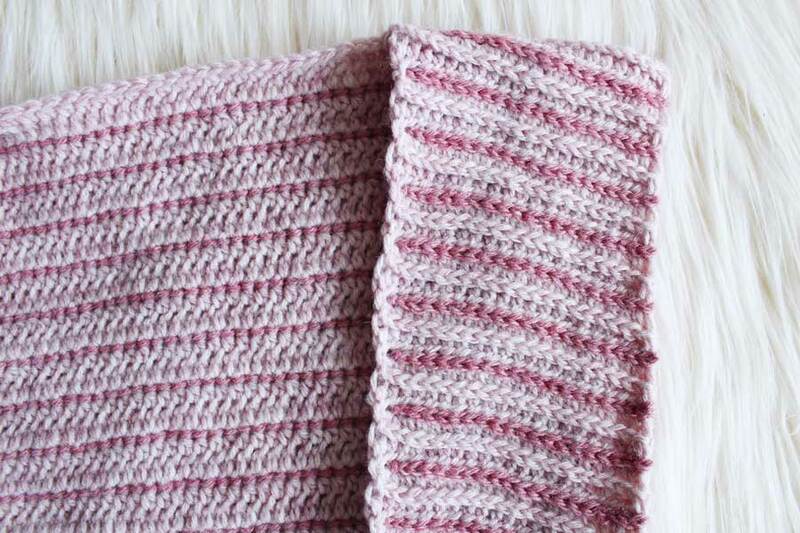 Remember, you can purchase this project as a complete pattern with Lion Brand Yarn! You can find the kit here! I can't wait to see photos on social media! Be sure to tag me on Instagram (@the.hook.nook) and use hashtags, #thehooknookers and #lionbrandyarn to share with our communities!